The Westin Chosun Seoul, Tuesday, November 14, 2006- Thanksgiving Turkey is back, and even richer and more flavorful than ever at vecchia e nuovo deli! 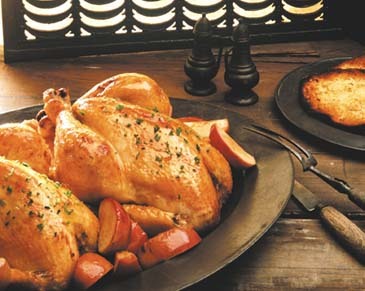 An absolute must-have for your holiday feast, the tender and succulent meat will satisfy the heartiest of appetites. Order a delicious Whole Fresh Roast Turkey in three different sizes, and Chestnut Stuffing, Giblet Gravy, Cranberry Sauce, Mashed Potato and Brussels Sprouts will be included. You can also choose from various additional side orders like Maple Glazed Sweet Potato and Broccoli with Almond Butter. Since no Thanksgiving dinner is fully complete without a scrumptious pie, complement your holiday fare with our freshly baked breads or Apple, Pumpkin, or Pecan Pies. A minimum of three days notice is required for your order, so please place your order in advance. Avoid the last minute rush and fill out the form, indicating the time you wish to pick up your order, and we will have it ready for you.